The RJE Sales & Design departments took a road trip to Chicago’s Furniture Mart to visit the DIRTT Green Learning Center (GLC). RJE just became the only Indiana authorized dealership for DIRTT. 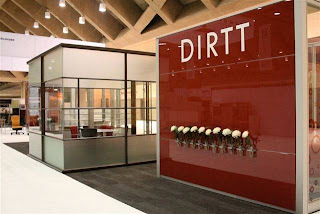 DIRTT Environmental Solutions is manufactured in Calgary, Alberta and their acronym stands for Doing It Right This Time. DIRTT is not just meant for the conventional commercial office environment. DIRTT can be utilized in other market segments including health care which was a large focus of the Chicago GLC. The DIRTT solution consists of multiple layers, primarily structural, aesthetic, technological, and application specific. Each of these is comprised of several sub-modular layers. It is through this multi-layered approach that DIRTT can support a high velocity of install and manufacturing, simply because multiple processes and activities can be done in parallel in multiple locations. Beyond the “wall” system itself, DIRTT Modular Electric and Data shares the same approach to modularity and applies it to power and communication distribution. This solution is a “plug and play” system, and brings a significant level of freedom to the DIRTT environment and the client solution as a whole. There are no practical boundaries to this; the solution provides adaptability, speed of install, material efficiency, lower cost, and sustainability to floor, ceiling, and drywall distribution of power as well. DIRTT’S specification software ICE, allows the RJE team to explore design choices while working side by side with our clients. ICE also provides apples to apples price comparison and visual 3D images. DIRTT and RJE are committed to providing solutions that reflect the needs of the client in every way.